This volume is the first comprehensive resource to assist neuropsychologists to provide culturally competent services to Asian Americans. It highlights pertinent historical socio-cultural characteristics of the largest Asian American ethnic groups, which helps to conceptualize presentation, provide an optimal environment for test administration, interpret tests within a cultural context, and offer culturally sensitive feedback and recommendations. In addition, the volume gives a summary of the available neuropsychological literature for each Asian American ethnic group, recommendations for testing, and illustrative case samples. The second purpose of the volume is to provide a glimpse of how neuropsychology is currently practiced in different Asian countries, by reviewing the neuropsychological literature and by listing the available resources. This information gives valuable insights to neuropsychologists working with Asian communities throughout the world. 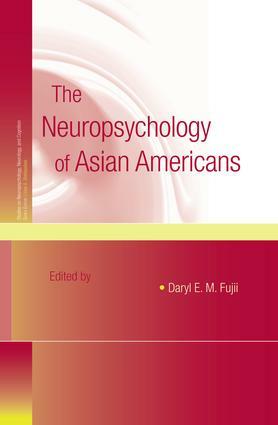 Neuropsychology of Asian Americans is an essential resource for clinical neuropsychologists and school psychologists who perform neuropsychological services to Asians. It is also an important resource for academic neuropsychologists and students with Asians in their sample, as cultural variables may have moderating effects on data that information in this book helps to elucidate. Daryl Fujii is a board certified clinical neuropsychologist (American Board of Clinical Neuropsychology) and a fellow of the American Psychological Association. He has over 50 publications including an edited book, The Spectrum of Psychotic Disorders. Daryl has been actively promoting cross cultural neuropsychological competencies through his involvement with the American Academy of Clinical Neuropsychology (AACN) and Veteran’s Affairs Psychology Diversity Training Committee, and mentoring ethnic minority neuropsychologists through his participation in APA’s Division 40 Ethnic Minority Affairs Committee as well as training practicum students, interns, and post doctoral fellows. Daryl currently works as a geriatric neuropsychologist at the Pacific Island Health Care Services Center for Aging and is an international consultant and lecturer.